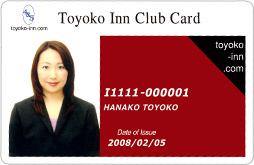 The Toyoko Inn Club Card International is a non-credit members card that can only be used at Toyoko Inn hotels. Anyone around the world can enter the membership and when you register upon check-in, you will get the card by the time of your check-out, so no long waiting time is necessary. You also can collect bonus points and convert them to free stay coupons at our hotels anytime you prefer, a service that is very popular for its convenience. Special daily discounts are available from the first day of your International Club Card membership, with 20% discount on Sundays or holidays and 5% discount on weekdays. This coupon can only be used for a one night stay in a single room for one person. When using a free accommodation coupon in the following cases, you will be able to pay the price difference with either cash, credit card, cash vouchers (limited to Toyoko Inn campaign vouchers) or Toyoko Inn gift vouchers. Starting right on the day of registration, Toyoko Inn Club Card International members can receive discounts on their accommodation rates by presenting their membership card. The member's discounts can be combined with our ECO Plan and various vouchers. Special campaign discounts and free stay coupons other than listed above cannot be combined with the member's card discounts. Some guest room types might be excluded from this. Discount rate is different in Toyoko Inn Marseille Saint Charles. A smooth and easy check-in by just signing the accommodation card. Unlike the 3 months applying to regular customers, Toyoko Inn Club Card members can make a reservation 6 months prior to their stay! Thus you can secure your preferred room in preparation of busy time periods. Check-in for Toyoko Inn Club Card members starts at 3 p.m. - one hour earlier than for regular guests! Only available at hotels that have implemented the card key system. There are hotels where you cannot use your card as room key. Many facilities in Japan offer special benefits to the Toyoko Inn Club Card members. Guests are required to show their own card to receive benefits. Membership discounts apply only to rooms where the members are staying. If two members are sharing a twin or double room, only one member will earn the accommodation points. Benefits will not be applied when using any website other than official website or a travel agent. Also cannot use single free stay coupon. When using single free stay coupon, accommodation points nor will be credited. This cannot be combined with campaigns and plans that involve discounts. When creating the card, I will review the public certificate. Students are required to present a student card (not copyable). I will make a copy. The International Card is available for middle school students or older. Registration fees are as follows. These contents are subject to change without prior notifications. Guests will not receive discounts or points without showing a membership card. Please remember to bring it with you. Copies or a photo of the card will not be accepted. Guests are required to show the actual card. Please read and understand the following.